The Women’s Board organized a Preview Lecture Series. During Dot Smith’s presidency (1956–1960), the lectures were held at the El Mirasol Hotel in the Garden room, with luncheons following. William Hartshorn, Director of Music for Los Angeles Public Schools, gave the first five Preview Lectures (Dot Smith, 1989, CAMA archives). 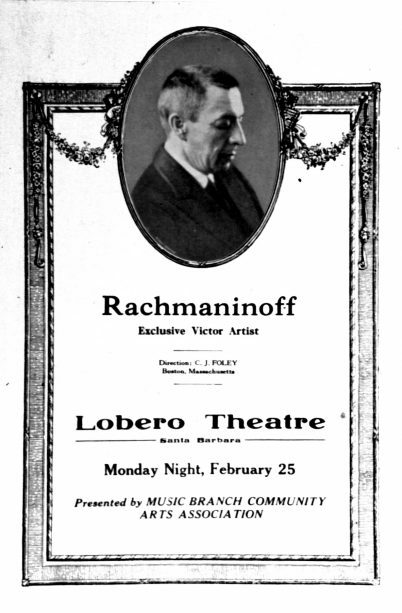 Notable events from the 1950s included CAMA’s presentation of the one-hundredth official concert by the Los Angeles Philharmonic in Santa Barbara on November 5, 1952. Mayor Norris Montgomery commemorated the occasion with the declaration of “Symphony Week” from November 2 to 8. 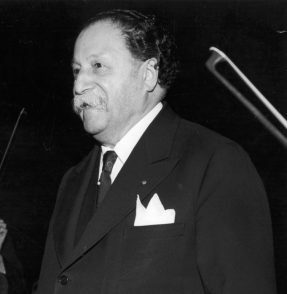 The Boston Symphony, with Maestro Pierre Monteux, made an appearance in Santa Barbara on May 5, 1953 as part of its first visit to the West Coast since 1915. CAMA Board Member Stephen Cloud notes that “with the 1950s came the expansion of the orchestra series and concerts by the New York Philharmonic under their dynamic new conductor, Leonard Bernstein.” CAMA productions from the 1950s also featured recitals by pianists Robert Casadesus and Rudolf Serkin, and violinist Erica Morini; and concerto appearances by pianist Claudio Arrau and cellist Mstislav Rostropovich, both performing with the Los Angeles Philharmonic directed by Arturo Basile.